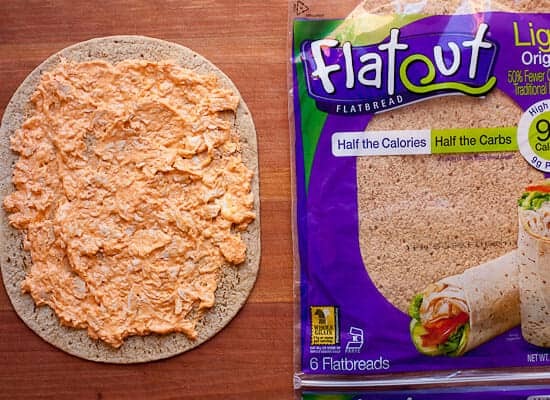 This post is sponsored by Flatout Flatbreads! Try their popular light original wraps and check out flatoutfinder.com to find some near you! In my opinion, this week is one of the best weeks of sports for the entire year! I’m not a huge college basketball fan, but it’s hard to not be pulled into the madness. This year my alma mater (with controversy) is even in the tournament! Go Elis! I’ll be sure to root for them in the one game they are guaranteed to play in and you better believe I’ll be eating well while I do it. Since there is basketball pretty much nonstop for four days straight this weekend, it’s important to pace yourself on libations and foods. 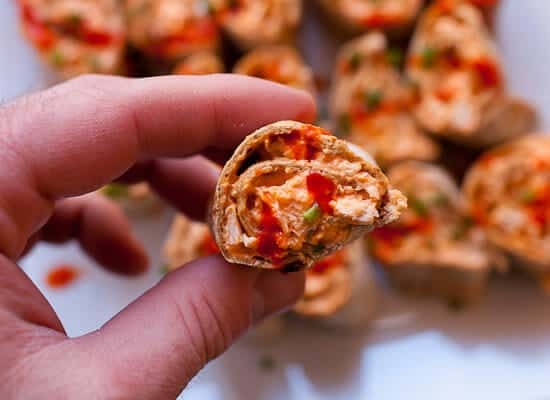 I like little snacks that store great, can be made in advance, and don’t need to be kept warm. A perfect game day appetizer with just five ingredients! Make them in advance and watch them disappear! 1) Poach chicken breasts in barely simmering water for 15-20 minutes until cooked through. Then cool and shred or finely chop chicken. 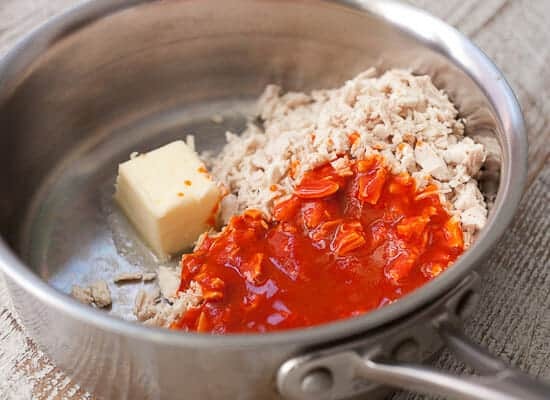 2) In a medium pot, add butter, shredded chicken, and hot sauce over low heat. Stir together until butter is melted and sauce is evenly coated on chicken. Then remove from heat and stir in cream cheese. Let mixture cool for 10 minutes in the fridge until it thickens. 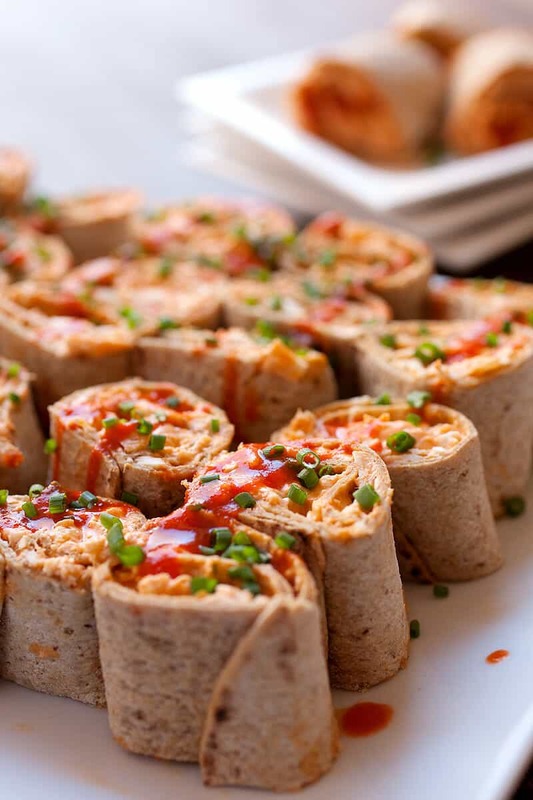 3) Working with one wrap at a time, add about 1/4-1/3 cup of buffalo chicken mix on the wrap. Roll into a tight cylinder and cut into 5-6 even pinwheels. (A serrated knife works best for cutting the pinwheels). Serve with an extra drizzle of hot sauce and chopped chives. If you are storing the pinwheels for later, keep them rolled until you serve them and then slice them right before serving. You need about a pound of chicken for this recipe. 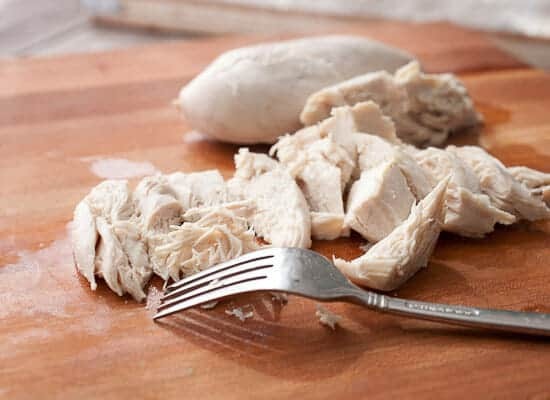 If you want to make the recipe even easier, you could actually just grab a rotisserie chicken from your deli and shred that up. But, if you’re starting from scratch, just poach a few chicken breasts in simmering water. It doesn’t need to be a boil or anything. After 15-20 minutes they should be cooked through (test one though). Then let the chicken cool a bit so you can handle it and shred it with a fork. After I shred my chicken, I also like to run my knife through it a few times just to make it a finer consistency. Now add the chicken back to the pot with some butter and hot sauce! You can use your favorite brand of hot sauce, but I recommend getting one labeled BUFFALO for obvious reasons. Stir that all together over low heat until the butter is melted and the sauce evenly coats everything. Now it’s cream cheese time. 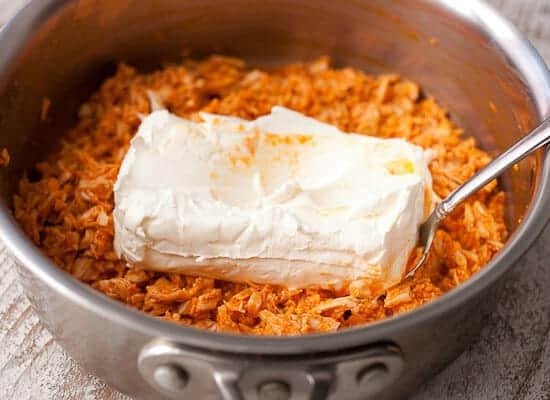 At this point you can remove the chicken from the heat and the residual heat will soften the cream cheese so you can stir everything together. 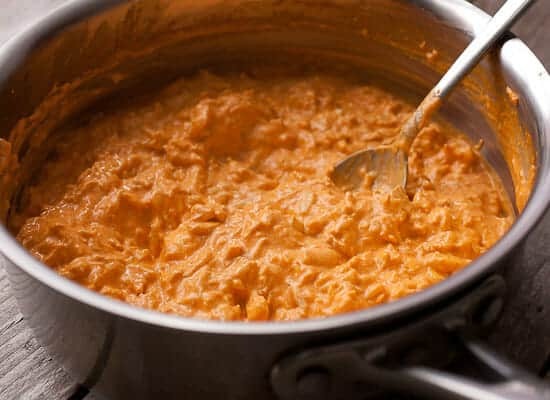 This is a pretty solid buffalo chicken dip with tortilla chips or something just like this! 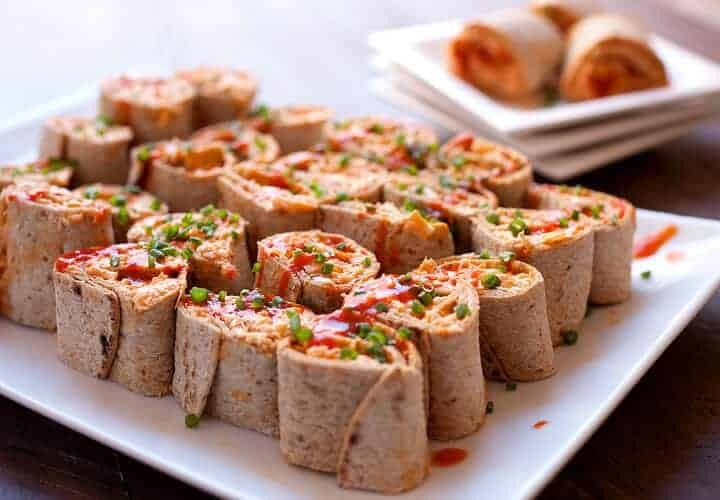 I used two different flatbreads for these pinwheels, but you could pretty much use any flavor! I like the light original flavor and the harvest wheat variety. 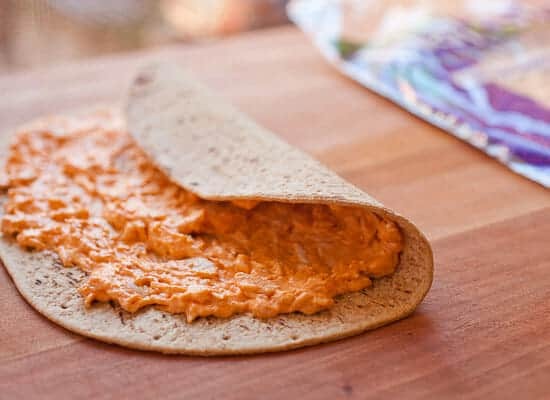 Just lay out a flatbread and smear on a layer of the chicken spread. Then roll it up into a tight pinwheel! You want to roll it so you end up with a longer, thin cylinder rather than a short fat cylinder. Use a serrated knife to chop these up. That’ll help keep the filling in place and slice through them easier. A little extra hot sauce and some chopped chives just for good measure. Not totally necessary! Boom. 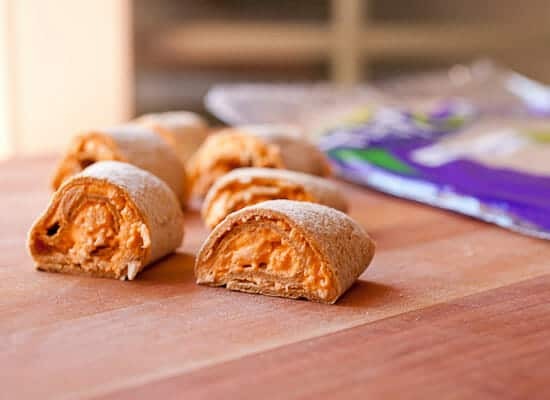 Delicious buffalo chicken pinwheels are ready to go. Thanks to Flatout Flatbread for sponsoring this post. Be sure to like them on Facebook and follow them on Twitter for other great flatbread recipes! If this it’s the championship game, this is my go-to play. Can’t wait to try these spicy little guys!